VISCO company logo ©2000 VISCO CORPORATION. I’ve probably spent more time trying to write this article about VISCO Corporation than any other i’ve written for the site so far. VISCO only actually released one title for the Dreamcast exclusively in Japan and personally while i found it to be a decent enough title it’s just not a particularly memorable one to the extent i had actually completely forgotten that the company had even been a publisher who had released a title for the system. Researching VISCO has proved to be something of an impossible task as while previous incarnations of their official site have been archived, they don’t provide a complete history of the company’s business interests or even a comprehensive listing of their published works. I’ll give a brief overview of the company that can be corroborated by official sources and before i discuss their Dreamcast title i’ll briefly mention the unconfirmed reports of VISCO’s alleged subsequent business interests and i’ll leave it up to you to make your own mind up if you think their plausible or not. What can be confirmed is that VISCO were established on the 8th of August ’83 and at the time of their Dreamcast development they were based in the Kita-Ku district of Kyoto, Japan. At this time their archive site lists their business interests as Video game software for professional use, Prize machine planning development and sales & planning, Development and sale of home video game software. They also operated an amusement centre business entitled Kids Land which unfortunately i’ve been unable to confirm if it was a single location or at multiple sites or what happened to this aspect of VISCO’s business. They do have an official site still online but it’s a rather perplexing situation as it appears for all intents & purposes to be a back-up of their official site from sometime in ’05. That’s when their last known software title of Clown Magic CHERRY RUSH is presented as their newest release combined with the distinct lack of any year specified on the sites copyright makes me believe this is the case. While both a prolific developer & publisher of consumer software in their native Japan it’s arguable that VISCO is best known primarily for their arcade heritage most likely for their NEO GEO titles which included such titles as Andro Dunos, Breakers & NEO Drift Out: New Technology. The company was also known along with fellow amusement developers Sammy & SETA as one of the companies behind the SSV arcade hardware hence the SSV moniker. 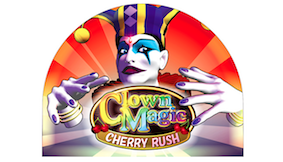 While i can’t confirm it i believe VISCO’s last known title that they published, Clown Magic CHERRY RUSH was the final title released on the SSV system in ’05. After this confirmed information about the company becomes somewhat scarce which may or may not result from their other non-gaming business interests detailed below. One aspect that is seemingly lost to time is VISCO’s involvement in a failed construction project which unfortunately, information is almost non-existent about but this might explain why the company seemingly became almost dormant if not outright defunct. The only information i could find was an archived article by Gamespot Japan which covered the subsequent bankruptcy of one of VISCO’s partners Towa Japan Co., Ltd who had debt’s amounting to 5 billion yen. The article also mentions that VISCO were effectively able to continue operating. The little information i could find about this situation was three companiesトーワジャパン, 丸石産業 & ビスコが were involved in some sort of construction venture that meant VISCO’s two partners were subsequently made bankrupt. VISCO themselves incurred a debt of 5.5 billion yen and as well as these losses suffered by the partners another equipment supplier absorbed massive losses. This left VISCO themselves being responsible for debts to the company totalling 800 million yen. The archived Gamespot Japan article is linked to below. Copyright (c) 1999 by SOFTBANK Publishing Inc. All rights reserved. VISCO’s home consumer output effectively finished with their Dreamcast’s title release in very late ’00. I believe that the company over the next five years developed just two more titles for the amusement sector. The first of these was ロイヤルジョッキークラブ or Royal Jockey Club which is designated as a medal game. Unfortunately, i’ve been unable to establish an actual release date for the game but i’m convinced it would’ve been at some period after ’02. The game is a JAMMA compatible board and it was actually distributed by TAITO Corporation. The final title attributed to VISCO was as i’ve previously mentioned Clown Magic CHERRY RUSH the only reason i’ve been able to confirm its release date is its copyright information is displayed on its title screen. Being completely honest everything else relating to VISCO after ’05 is complete speculation as there’s no confirmed information about VISCO whatsoever after this time. There are a multitude of online sources and articles which state VISCO changed focus and went into new markets. The two main competing theories are firstly that VISCO developed titles exclusively for the Asian amusement market. This is of course entirely possible but i’d expect that even if the company changed their name there would’ve been some contemporary information about this new venture. I can find nothing relating to any new titles or even any possible links to VISCO when researching this possible avenue which personally, makes me think that was an unlikely outcome for the company. The other popular theory is that a company called VISCO manufactured televisions for the American market which occurred around ’07 when giant US retailer Walmart began retailing VISCO branded televisions. The company behind these televisions was VISCO USA, Inc which i’ve struggled to find much information about. Again, it’s plausible but for me it simply doesn’t ring true for me due to the fact that even as late as ’05 which was the last incarnation of VISCO’s official site they made no mention of an American subsidiary company and were heavily in-debt due to their previous non-gaming endeavours. Given that VISCO’s output was basically negligible i don’t realistically imagine that the company had the financial ability to manufacture and market electrical devices such as televisions exclusively for the American market. Currently the VISCO brand has been somewhat revived and independent publisher JoshProd currently releases officially licensed Dreamcast titles from VISCO’s back catalogue. The company has to date released three VISCO licensed titles on the Dreamcast the first of which Breakers was released on the 9th of June ’17. A further two titles followed Ganryu on the 27th of November ’17 & Bang Bang Busters which as of writing this article in august ’18 has just recently been released. While these releases are not sanctioned by SEGA, they are officially licensed VISCO titles and the quality of JoshProd’s releases is comparable to officially licensed Dreamcast titles. The company’s titles come on professionally pressed CD media and in either Pal, NTSC U & NTSC J packaging. I’ve contacted JoshProd who were very helpful but couldn’t disclose any information about their licensing deal with VISCO. Bass Rush Dream ~Eco Gear Power Worm Championship~ logo ©2000 VISCO CORPORATION. 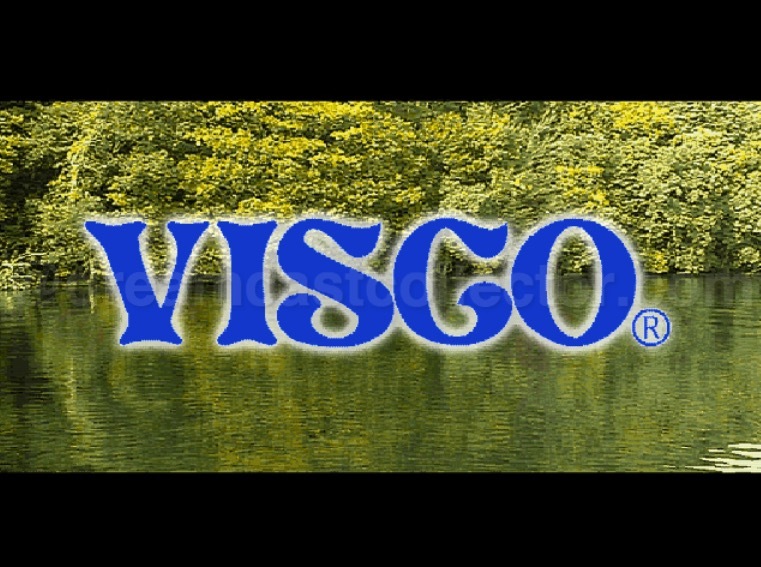 VISCO company logo as featured in Bass Rush Dream ~ECOGEAR PowerWorm Championship~ ©2000 VISCO CORPORATION. It appears that the Dreamcast incarnation of the game was an enhanced version of the previous Nintendo 64’s Bass Rush ~ECOGEAR PowerWorm Championship~. In all honesty i’ve never played the Nintendo 64 original but after researching the game and viewing video content it seems to be a graphically impressive release for the system. VISCO themselves described the Dreamcast incarnation as a powered-up version of the game and in all honesty if you weren’t aware of the previous N64 game you’d be forgiven in thinking that it had been developed for the Dreamcast from the ground up. The game looks & sounds as good as any decent Dreamcast title form the era which is no mean feat given its roots. There are however numerous differences between the N64 original & subsequent Dreamcast conversion. 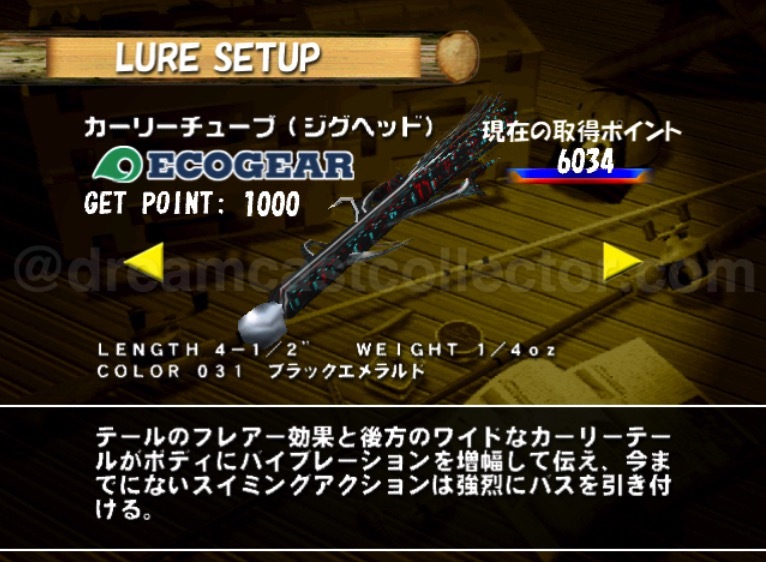 According to the N64’s incarnation of the game’s official site it states that the game has 102 lures to use in the game while the Dreamcast version has increased the number of lures available to 124. While certainly not the most important aspect the games graphical & audio presentation has been totally overhauled to take advantage of the increased power of the Dreamcast and is comparable to any title developed exclusively for the system. Bass Rush ~ECOGEAR PowerWorm Championship~ on the Dreamcast took advantage of the hardware in a number of different ways which would’ve been impossible on the previous N64 version. 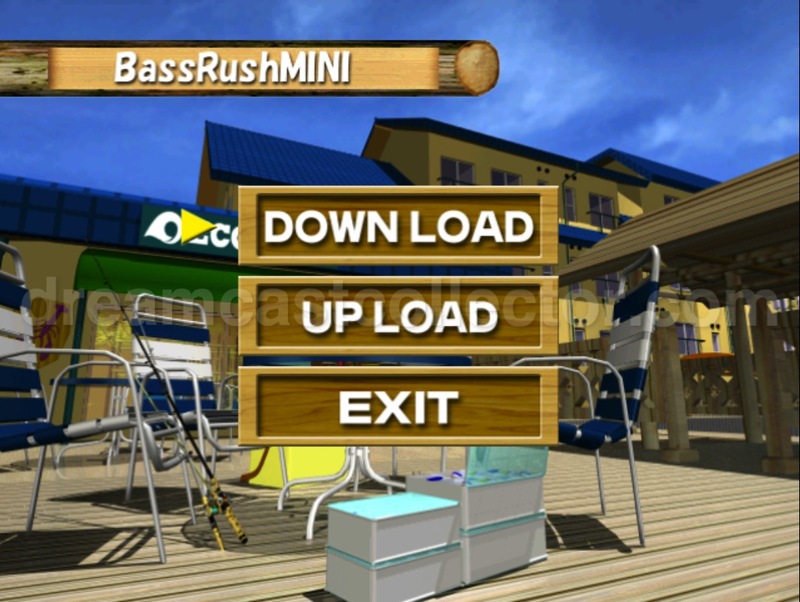 The game has an exclusive downloadable minigame called BassRush MINI which is an approximation of the main game in which you can unlock items in the special items category which includes the licensed ECOGEAR lures. The BassRush MINI game needs thirty blocks to be able to be downloaded from the main menu screen. I do have a VMU save with most items unlocked that i can share if needed. 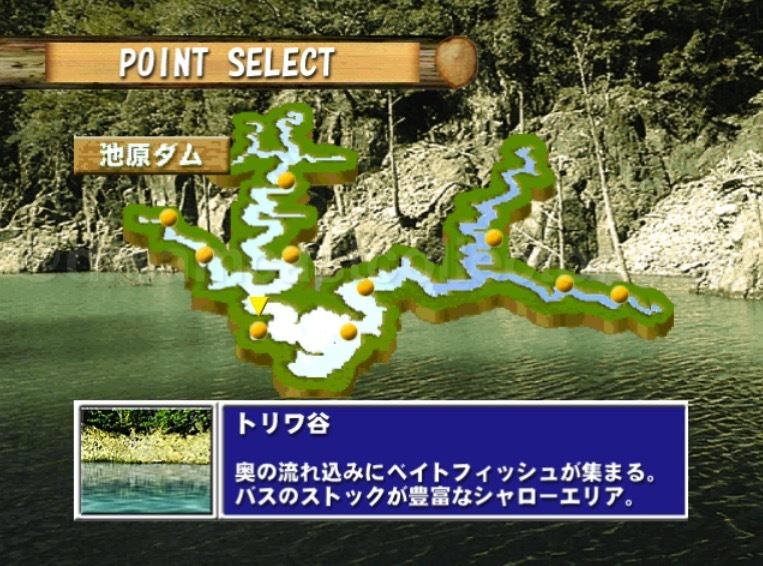 The game features six real world locations in Japan which i can only assume are preeminent angling sites they are, Lake Kawaguchiko, Lake Kitaura, Lake Nojiri, Lake Kasumigaura & Lake Biwa and finally Ikehara Dam. Initially only three of the lakes are available and you unlock more as you progress through the game’s tournament mode. According to VISCO there’s a secret lake that’s unlocked after completing all six lakes in the tournament mode unfortunately, i’ve never managed to get that far to actually unlock it. While you possibly might not think six real world locations is enough but each individual lake features ten different points to cast from. This makes it entirely possible just from one lake to find yourself in completely different circumstances from one location to the next each presenting a different challenge. At the locations you’re not just static your able to walk some distance to the left or right to get into your ideal position to cast from. One thing i appreciate is your able to at any time switch to an overhead perspective to get a better view of the area you’ve just cast into. 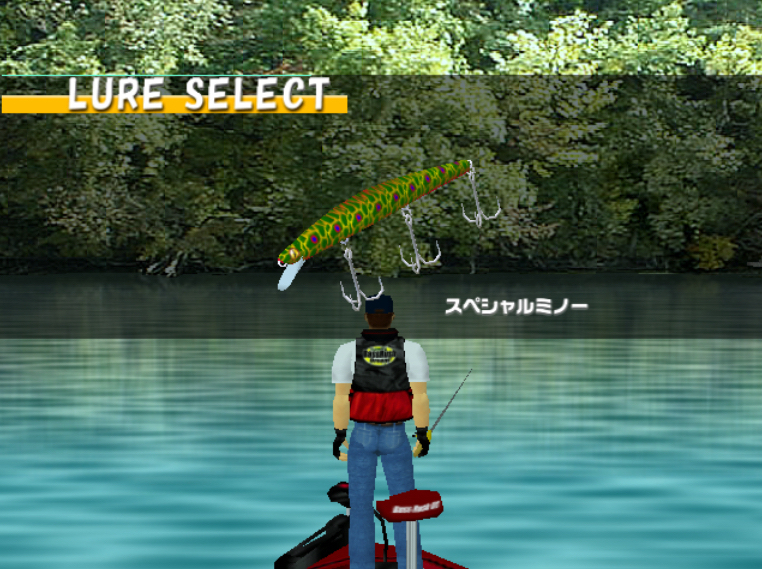 I’ve only played the fishing titles on the Dreamcast and i can’t recall any of them also implementing this feature which is a surprisingly useful addition. 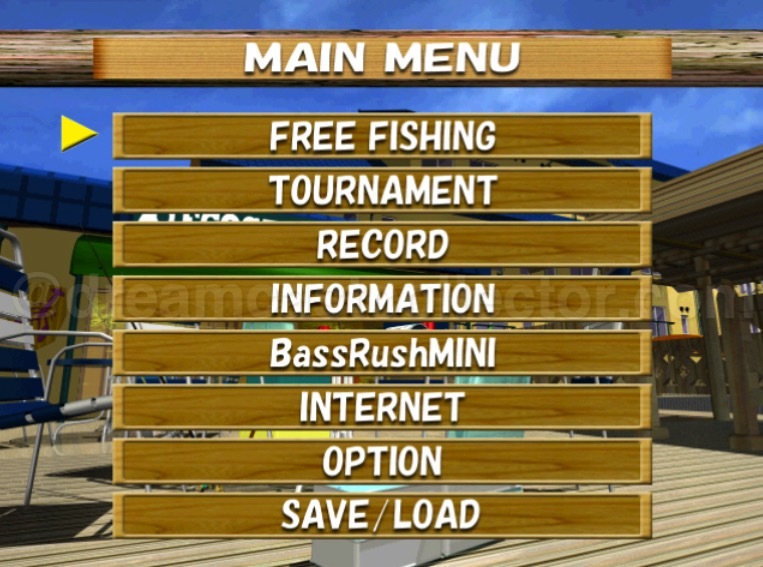 Bass Rush Dream ~ECOGEAR PowerWorm Championship~ also features a free fishing mode which since i’m not much of a fishing enthusiast is where i generally spend my time with the game. You have the same choice of any of the six lakes and all there various fishing locations as well as this you can customise almost every parameter of your fishing experience from the season, time of day & weather conditions to suit your personal taste. 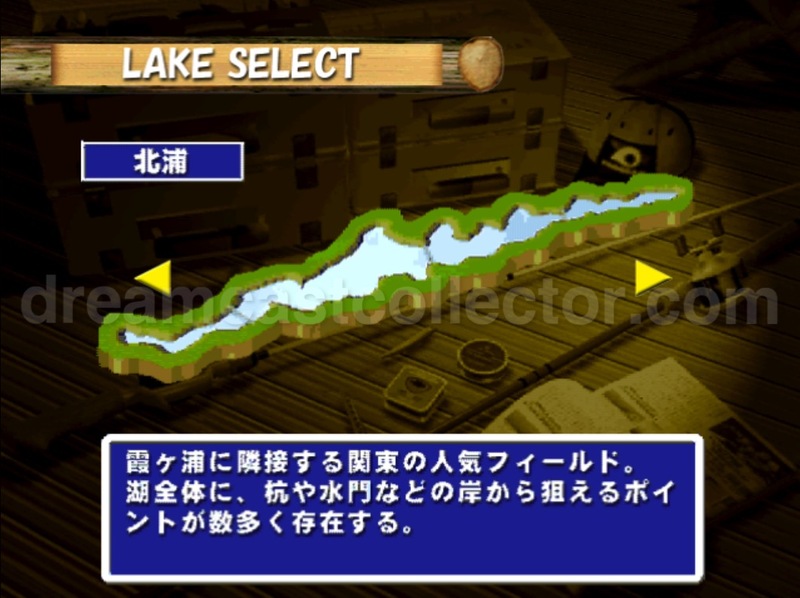 It’s also good practice to get used to the nuances of each new lake you unlock before engaging them in the game’s tournament mode. 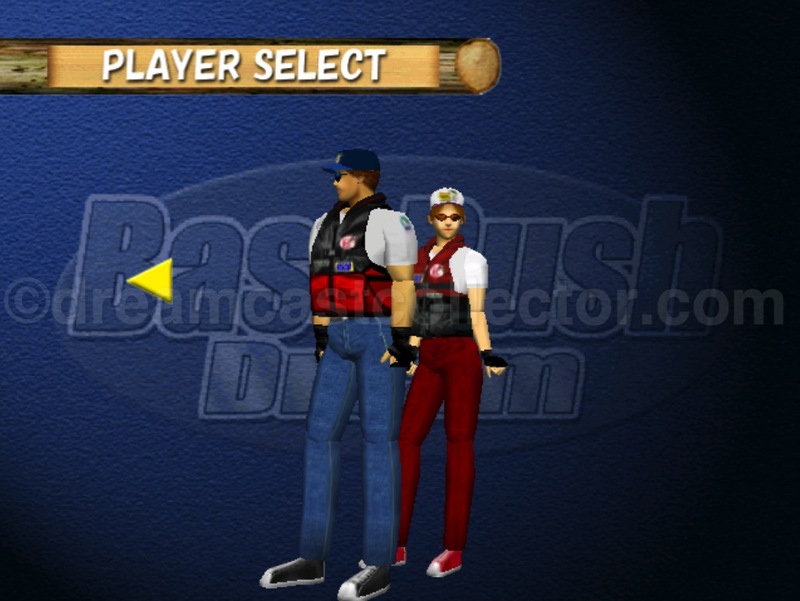 VISCO also took advantage of the Dreamcast’s in-built online connectivity and the Dreamcast version of Bass Rush Dream ~ECOGEAR PowerWorm Championship~ supported online tournaments as well as monthly rankings. Having never experienced the games internet modes for myself i’m unable to comment but the tournaments seemed popular with players and VISCO’s archived site seemed to have announced the monthly winners on their official site with regularity. The prizes for the top three winners for each lake was Not for Sale goods the only ones i’ve seen appear to be actual fishing lures with Bass Rush Dream branding on their packaging. I’m confident given the ECOGEAR sponsorship no doubt some of their equipment was made available for prizes & promotional opportunities. 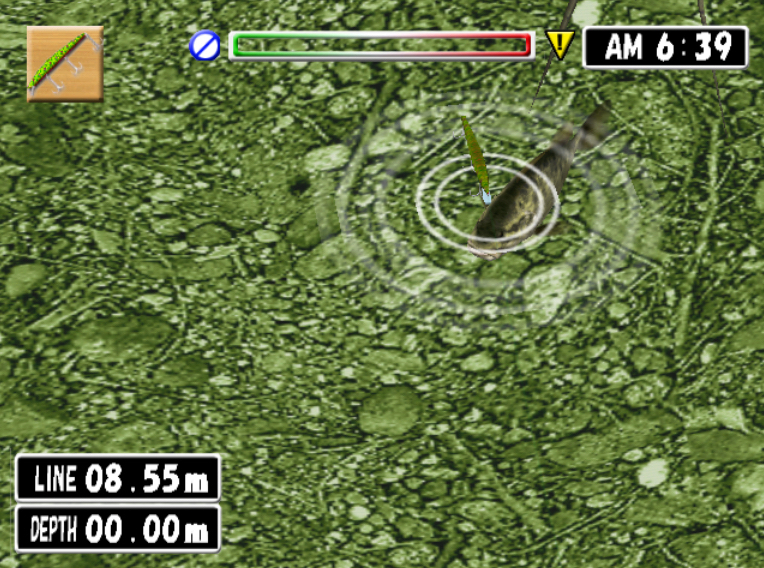 VISCO’s Dreamcast title has an interesting visual aesthetic in which the game’s background elements are actually real digital elements of the actual six lakes featured in the game. This are then merged with the foreground and underwater objects which are rendered in 3D. 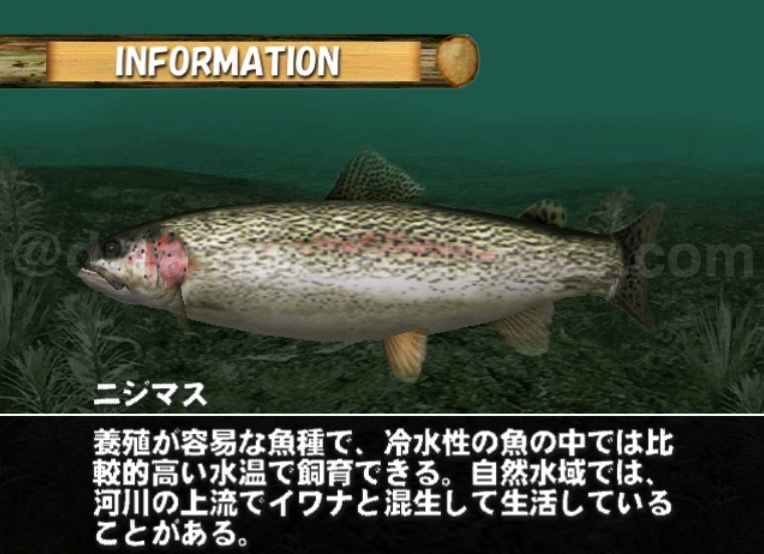 This gives a realistic feel to the game which is enhanced by interactions between these elements with digital splashes that have been added to the static backgrounds to provide a visual clue to where fish are currently inhabiting. Thankfully when converting the game to the Dreamcast VISCO enabled VGA support allowing the game to take advantage of the system’s ability to output a high-resolution VGA signal. It would be completely fair to describe myself as a layman when it comes to the sport of angling or fishing in general. A very useful feature for myself which would undoubtably been appreciated by enthusiasts is the INFORMATION section on the main menu. Realistically a better description would’ve been encyclopedia as that’s the function it provides with detailed in-depth information for all aspects of the game. Lures are displayed by type and clicking on your selected grouping your given a detailed 3D model and relevant information about your chosen lure. For myself with no real knowledge about angling i found this immeasurably helpful while it didn’t make me particularly good at the game i did manage in general to use the right lures that the situation called for. It’s not just lures that receive this treatment the various species of fish found in Bass Rush Dream ~Eco Gear PowerWorm Championship~ are equally well catered for. This for me is the only real gripe i have with the game as while it features many different forms of marine life i would have preferred some more variety available. This however is probably unfeasible as given the games title of Bass Rush Dream ~Eco Gear PowerWorm Championship~ and that’s what the intended audience no doubt would expect. While i can’t conclusively state it i expect the types of fish showcased are native to their geographical locations featured in the game. In all honesty i was rather ignorant about VISCO’s Dreamcast title to the point even forgetting that the company had even released a title for the system. Since i came to acquire the game sometime after it had been released i initially thought a conversion of a title from Nintendo’s N64 system wouldn’t inspire me with much confidence especially with a relatively niche developer in VISCO behind its release it quickly disappeared from my consciousness. 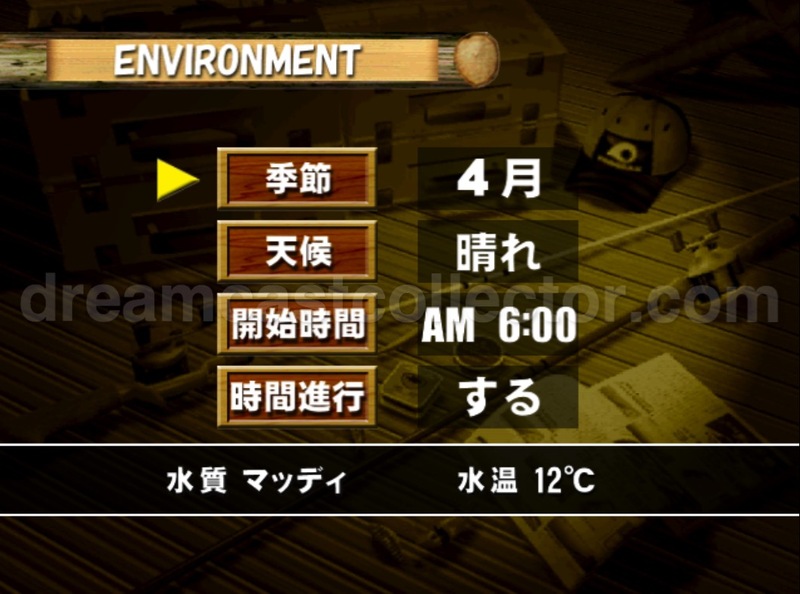 VISCO’s title was launched just as the Japanese Dreamcast release schedule hit its stride with many high-profile titles being released in the game’s launch window. Realistically for me it was simply overshadowed by higher profile titles upon its launch and i suspect that while based on a popular sport digital fishing recreations are by their definition a very niche genre. The fact that VISCO took full advantage of the Dreamcast hardware and improved all aspects of their game for Bass Rush Dream ~Eco Gear PowerWorm Championship’s Dreamcast debut is commendable. As i’ve previously mentioned if you weren’t aware the game was a conversion, you’d automatically assume it was simply a Dreamcast exclusive release. The Dreamcast incarnation of the game was released a scant two months after the N64 original which shows with the right development team it was perfectly possible to do more with previous generation game’s than simply increase the resolution and release them on other formats. The Dreamcast did have a number of the previous generation’s titles ported to it but i can’t think of one that actually took advantage of the hardware so well like VISCO’s title managed to do. I’ll prefix my overall opinion with a few caveats first of all its obvious but i’ll state it. 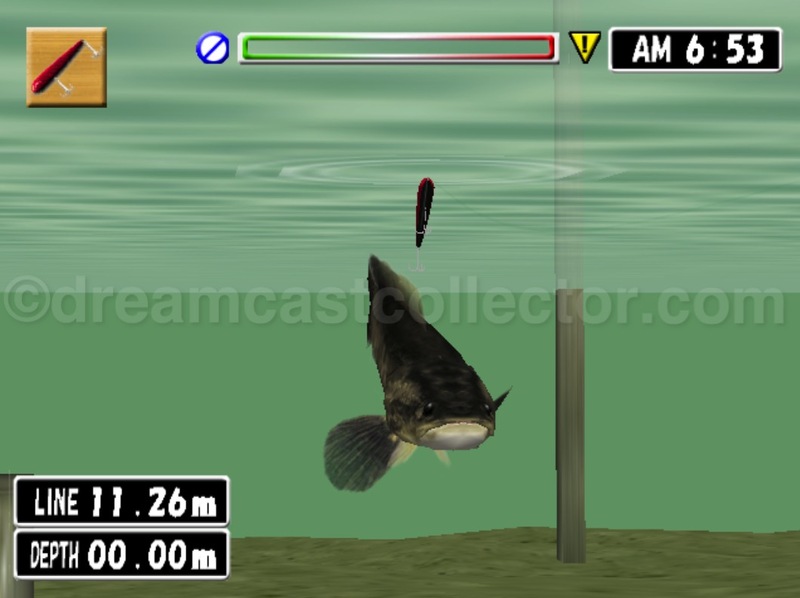 To get the most enjoyment out of the game you’ll definitely need the Dreamcast’s fishing peripheral to experience the best control option & immersion in the game. I’d argue unlike other genres where there’s fierce debate over which control scheme is best like the beat-em up genre with its hotly contested debate over arcade sticks or pads as the best control input option. 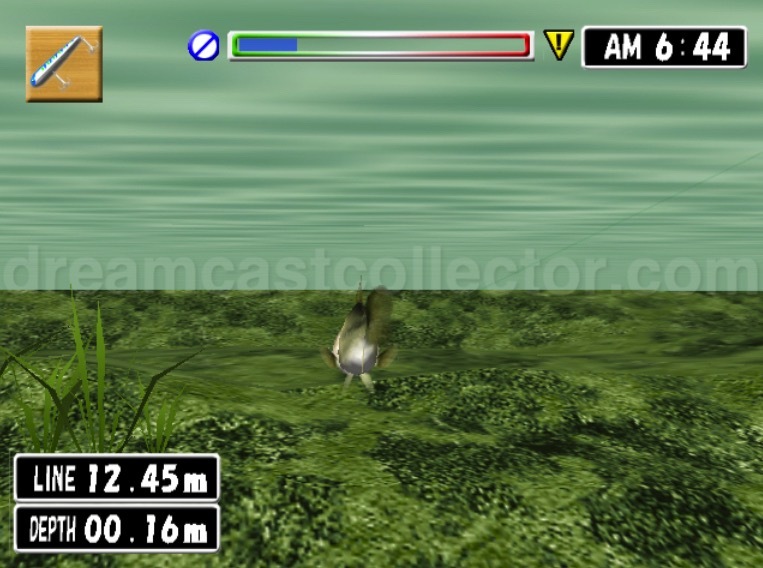 However, it’s almost universally accepted that the use of the fishing controller is an almost mandatory requirement for the Dreamcast’s fishing titles it’s simply not the same experience without it and honestly even more arcade natured titles like SEGA Marine Fishing lose a lot by playing on a standard Dreamcast pad. 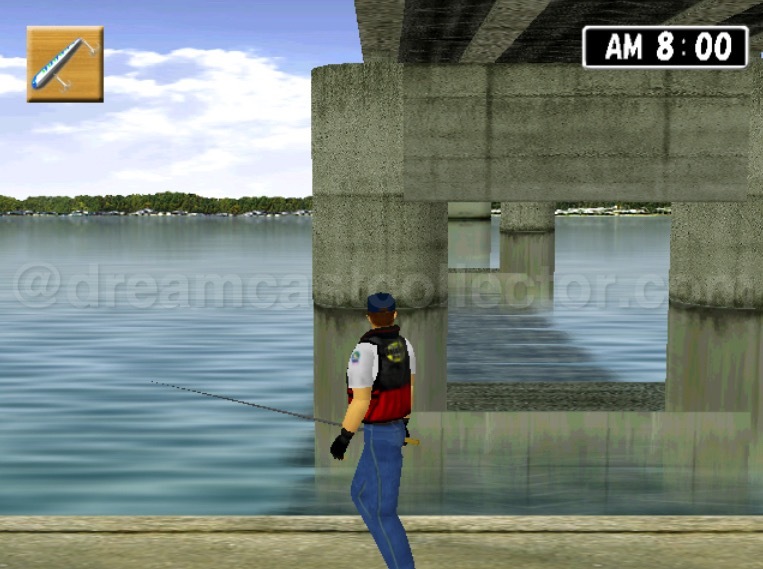 This is my personal opinion based on the genre i can’t attest to how other fishing titles function on other platforms as i haven’t experienced any outside those represented on the Dreamcast. If you’re looking for an arcade experience comparable to SEGA’s Fishing series of titles you’ll likely be disappointed. 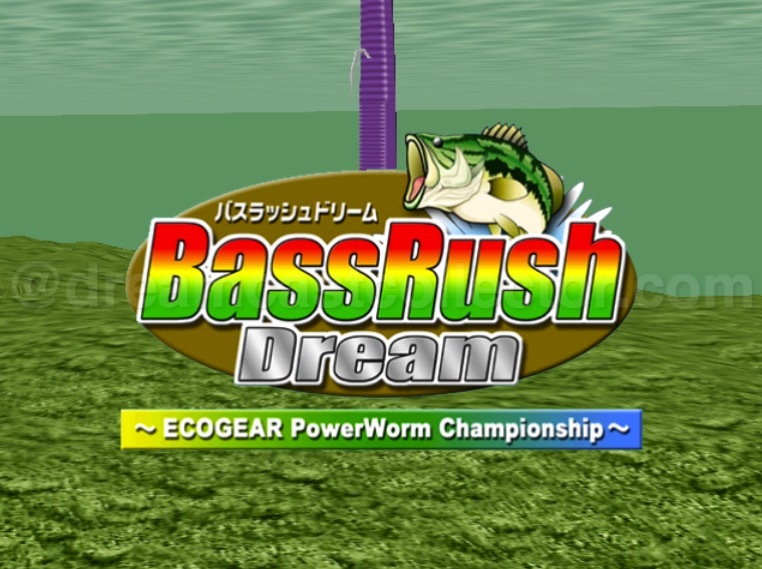 Bass Rush Dream ~Eco Gear PowerWorm Championship definitely leans to be amongst the genre’s more realistic simulation titles. I’ll mention that i have no real demonstrable interest in angling either virtual or in its real-life incarnation but i found the game surprisingly enjoyable. The actual gameplay is much more nuanced than the arcade nature of SEGA’s Bass Fishing title being closer to its sequel. This means that for me personally, i found the difficulty several magnitudes above what i had expected but i still enjoyed the game even through i wasn’t particularly adept at it. I never found the game frustrating and given my lack of enthusiasm for angling the fact i quite enjoyed BassRush Dream ~ECOGEAR PowerWorm Championship~ is to VISCO’s overall credit. (NOT FOR SALE) 非売品 discs & other media. I’ve personally, never encountered any individual Not for Sale discs for BassRush Dream ~ECOGEAR PowerWorm Championship~ nor am i aware of any content relating to the game on any compilation discs. Unfortunately, i’ve not actually managed to find any other sort of media relating to the game outside of the prizes VISCO offered. I was hopeful that there might have been a guide book but as yet i can’t confirm if one exists. The only media that i’ve seen that relates to the game is the various tournament prizes and the BassRush Dream ~ECOGEAR PowerWorm Championship~ branded lures that VISCO gave away as prizes for numerous competitions. Sadly, i don’t actually own any or have actually seen any up for sale i will however attempt to locate pictures and add them to this section if possible. As i alluded to early in the article i suspect that there would’ve been various ECOGEAR goods & equipment available for prizes or promotions. I’d like to thank JoshProd for taking the time out of their busy schedule to answer my questions about their licensing deal with VISCO. I’ll link to below to their official site which contains a variety of official social media links to their various titles. While i appreciate their input for the article i would like to make it clear that this article isn’t in any way shape or form sponsored by them nor did they have any input over its content.